The Toddler classroom has been very busy since the start of the school year: from wood polishing to gluing; from painting to puzzles; from hand work to reading; we are a busy bunch! We will continue to work on new skills and activities. We will be preparing for a variety of foods and exploring some new poems and songs. We would like to wish the best to those friends that have moved up to the Primary classroom and welcome our new friends that have recently joined the community. We will have some fun with the heart shape as we enter February. We will glue hearts, paint hearts, and use heart cutters with play dough and cooking. For our Valentine’s Week festivities we will share some special snacks, have a tea party and enjoy some homemade heart shape biscuits with jelly! Maria Montessori said that a child is not just happy when he is concentrating, but when he is building his identity. “The child who concentrates is immensely happy; he ignores his neighbors or the visitors circulating about him. For the time being his spirit is like that of a hermit in the desert; a new consciousness has been born in him, that of his own individuality.” (Absorbent Mind, Chapter 26, page 249). With concentration comes a joy of life, the world is seen in a different way as more knowledge is experienced. When the child knows how to use a tool or material he has control. As soon as the child has understanding and mastery of material he can see the world differently. In order to gain knowledge of the materials the child must be able to make choices and be shown how to use it, giving the child freedom in the environment. The child needs the freedom to choose and the freedom to repeat. The child needs to be able to repeat as long, and as much as he likes without being interrupted by anyone else. Repetition makes brain connections and solidifies or incarnates the information. 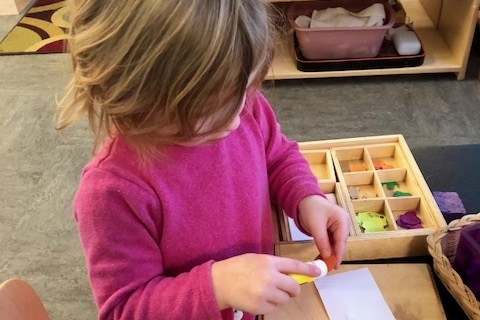 The children in the Toddler Community are developing so many skills and already have many opportunities to develop their concentration: from stringing beads to practicing to putting on their own pants the child is making brain connections and developing concentration. It is important to recognize this important part of development so that the adult can help the child develop concentration (sometimes we need to stand back and avoid interruption) when possible. Please continue to send layers for outdoors: sweatshirts/sweater layers, mittens, hats, warm jackets and snow pants. Mittens with thumbs are preferred so that the children can still use their hands to work/play outdoors. We will plan to go out everyday and will only stay in if it is extremely cold. For snow days and delays MSCVT will post information on local news channels (TV, radio and internet) and Facebook with any closing or delay information.